Even if the world doesn’t forgive you, I will forgive you. Even if you don’t forgive the world, I will forgive you. If you know the story the above poem that opens the series is stunning. Who is Frederica Bernkastel? What is going on in his series? You’ll have to read to find out. 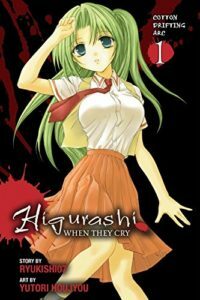 Keiichi Maebara is newly transferred to the sleepy mountain village of Hinamizawa in the summer of 1983. He’s quickly made friends with some of the local girls, Rena, Satako, Rika, and their leader, Mion. He feels like he has a new life. A new start from living in the city of Tokyo. 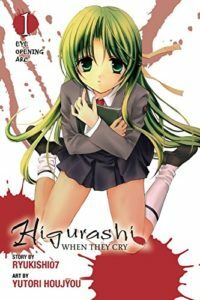 But there is something dark lurking beneath the surface of Hinamizawa, a dangerous past that his new friends are hiding from him. Why don’t they want him to know the truth of the village? What are the concealing from him? As Keiichi discovers more of the village, can he truly trust his new friends? Are Rena and Mion wanting to protect him, or are they setting him up to be the next victim? 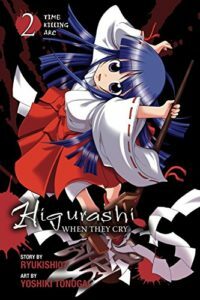 Higurashi is a rather interesting story. 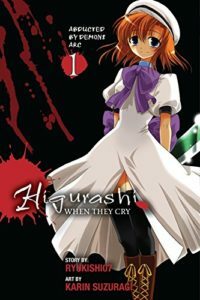 IT starts out light and fun, the characters introduced well. They have a fun atmosphere, hyper-competitive but in a good-hearted way. You can see that they know each other and are welcoming the newcomer Keiichi. And then he hears rumors about the village’s past. Suddenly his friends are acting weird. A sense of unease slowly pervades the story. Paranoia steps in as things grow more and more dire. The story has a mystery that keeps you reading while the characters keep you engaged. What is going on? What will happen? Are Rena and Mion truly his friends, or are they something else? These questions will be begging to be answered over the course of this manga. The art is great, bouncing between the playful to the tense with skill. The artist captures both with ease. If you’ve played the doujin visual novel this is based off of, you’ll see the story is being faithfully adapted. Higurashi no Naku Koro Ni is one of the best mystery series in Japanese pop culture. 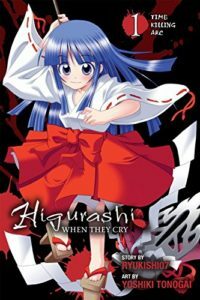 Whether it’s the anime, the original doujin novels, or this manga series, it’s worth checking out! 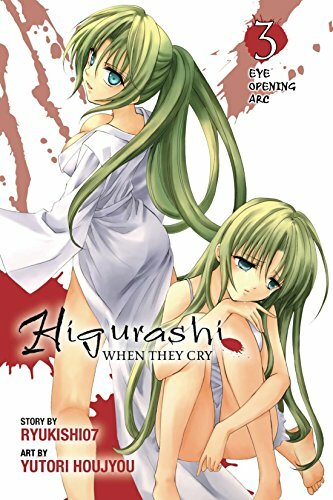 You can buy Higurashi Abducted by the Demon Arc 1 from Amazon.